In theory, I really like Origins, the natural brand from the Estee Lauder portfolio. However, I prefer the bodycare range and have previously found the skincare a bit hit & miss, loving some products whereas others haven't agreed with my skin. I decided to keep an open mind when it came to trialling Mega-Mushroom Skin Calming Face Mask. The Mask is designed to calm skin after too much sun, wind, dehydration, flying or late nights. I haven't been doing anything as exciting as jetting off for some winter sun or a ski break but the changing temperatures, going from central heating indoors to cold outdoors, together with a recent cold have left my sensitive skin in need of some TLC. Mega-Mushroom Skin Calming Face Mask is presented in a sleek, functional tube with clear directions making it easy to use. Simply apply to clean, dry skin, relax for 10 minutes, then tissue off. The creamy mask has a surprisingly lightweight texture which means that it applies smoothly and feels cooling on skin. 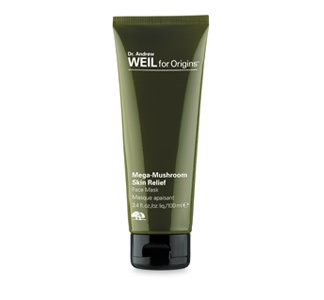 Everything about it appears to try to reinforce the natural message- it's a pale green colour with the distinctive earthy scent which is signature to the Dr. Andrew Weil Mega-Mushroom range of products. The scent won't be to everyone's liking as it is rather potent but personally, I liked it. It's been a while since I used a tissue off mask and I have to admit that I'd forgotten how wonderfully hydrating they are. My skin was left looking brighter, healthier and feeling soothed. At £32 for 100ml, Mega-Mushroom Skin Calming Face Mask is pricey but I did like it. Given that I'd probably only use this occasionally as a "rescue treatment", I'd prefer if it was available in a smaller size for a lower price. I love this face mask product because it makes me feel like I had an acne scar reduction after every use. It's also rejuvenating and refreshing!